Here it is 2016 and I’ve made a resolution to make a resolution about my blog (to post or not to post, that is the question). But it’s already nearing the end of the month, late going as usual, I guess. Within the past year or so, I’ve been getting nudges and questions via email and in person….what’s going on with your blog? Can you post more regularly? Are you quitting? And honestly, I have no idea. I’ve thought about letting this site go and just keeping it as is, an online archive of my recipes and life for the past 11 years or so (yes, eleven freaking years). Blogging isn’t as interesting to me as it once was. Readership is down, people don’t comment on blogs, and if you’re jonesing for comments, you have to be a social media rockstar or take a helluva great photograph or be an amazing wordsmith (and that’s just not me or my skillset). Instagram and Facebook and SnapChat are where people communicate and have conversations online and who knows what new social media outlet will come next to grab everyone’s attention. I’m not saying that blogs have become antiquated, but the atmosphere has certainly changed a lot in the past 3 or 4 years. There’s not a lot of commenting going on in the comment section. It’s chirp city and I get it, I do. I’m not on Facebook (publicly) or SnapChat but Instagram has picked up the online conversation for me. So it’s left me to wonder what’s up with this space anyway? Do people care if I update? And more importantly, what am I getting out of this little corner of the online universe? I can certainly point out all the things that this site has given me, from an ego boost and recognition to some seriously amazing lasting friendships. Not a bad haul, really. So will I continue hobbling along? Who knows, maybe! I still have things to share every at least for the time being. In the meantime, I have a recipe to share….this is a food blog after all! The best thing is that the inspiration for this recipe comes from one of my long-time blog readers and friend who I follow on Instagram. 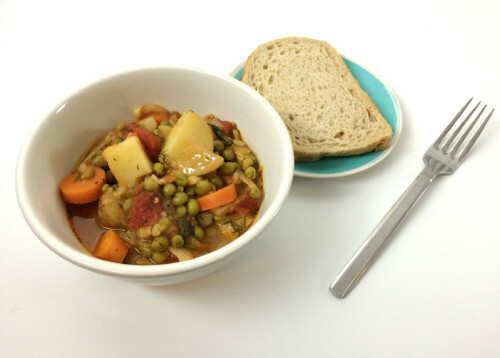 Way back in December she made a stew with potatoes, carrots, peas and dill and I was intrigued. And when the excess of Christmas was over and I needed something comforting and a little austere, I thought about this dish. The thing that stood out for me was the use of frozen peas. You don’t toss them in at the end to add pops of brightness. Instead, you cook them down with the potatoes and carrots to get stewy and oh-so-flavourful. They do not turn into mush. They remain peas, but darker, softer orbs of delightful pea-ness (that’s a good thing). I fed myself for several days with this dish (my husband wasn’t as keen as I was) and I was happy with every single bowl. As you can see from the photo above, there’s a lot of liquid and after sending a message or two to Joanne during cooking, I decided to scoop up about 1/2 a cups worth of liquid (I drank it like a savoury tomatoey tea). You can play around with the liquid and go for something very saucey or more reduced. I wanted something more akin to stew, not soup. Your call. 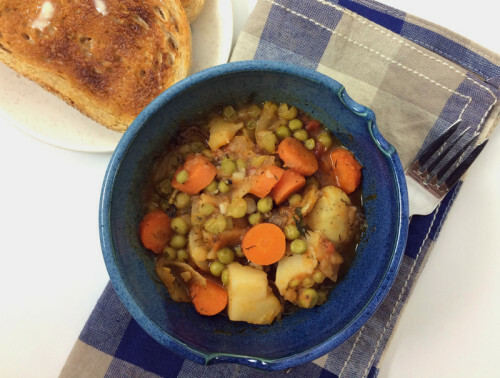 Joanne’s version is a bit different than mine – she adds a quarter cup of olive oil to sauté the onions and then simmers the potatoes first in water before adding the rest of the ingredients. Here, I use less oil, add in garlic, add in some dried herbs, and use stock instead of water. You can add more or less of most anything….this is rustic and simple cooking. The leftovers reheat well. In a large pot, heat the oil over medium heat and add in the onion. Let it sweat for a few minutes, do not let it turn brown. Add in the garlic and let that cook for a minute before adding in the potatoes and carrots and tomatoes. Give everything a big stir and then add in the peas, salt, dried dill, oregano and stock or water. Stir again, gently and cover. Simmer over medium-low heat for 45 minutes, stirring occasionally and adding in more water or stock if needed or leave the lid off if you need to reduce the sauce further. You may want a more saucey stew or something with more body. Remove from heat when vegetables are tender. Add fresh dill, a hammer of black pepper and give the mixture a final stir before serving into deep bowls. Top with crumbled feta and have plenty of crusty bread on hand. Well I for one would be v. bummed if ELS went away. You can’t post recipes on Instagram, and all the nice touches of your web site (printing, RSS feed, search, categorization) are useful when I’m looking for ideas. What would kickpleat do with kale? What desserts might be fun to make tonight? If you do think about turning it off, let me know what the annual hosting fee is and I’ll kick in a few bucks. I saw hints of this recipe elsewhere and am now SO happy to see it posted here. Looking forward to giving it a big stir in the very near future. Thanks for sharing – you make my kitchen brighter! I hardly ever comment, but 1. this looks delicious and 2. I just posted something similar on my own blog: I’ve lost the love for blogging as its become now (all the pinning, the need for everything to be shared here, there everywhere). Instead of quitting all together – I went through and deleted posts that I felt lacked real value (think list articles & round ups) and am taking my time to retest and rephotograph older recipes that I still love. This weekend I shot an old cake and seeing the new photos next to the old is a beautiful reminder of what I’ve really learned through blogging all these years. I hope you’ll find a similar exercise that will make the art of creating (which is all blogging really is) fun again. i just love your stories and wonderful recipes and the gorgeous vintage kitchen things in your photos! receiving your posts always brings me joy and a smile! thank you! I was JUST yesterday thinking that you haven’t posted in a while and wondering what was up. For what it’s worth, I love your blog. You’re food is just different enough from the others to keep it interesting, and I enjoy your writing and creativity. I think one of the problems with commenting is that some blogs have made it too complicated to comment. How nice to just be able to click “submit comment” after simply entering one’s email. I.e., Ezra Pound Cake…a blog I loved…you could only comment via FB (which I don’t do) and even Pioneer Woman has made entering her giveaways too complicated (raffle outer, I think? Too many steps) as is her site re-design (in my opinion). Not to be mean, I’m just saying, I am a technical simpleton! I’m sure for others it’s a breeze. Even if you just post once in a while, it’s still a nice treat and I thank you. Long time follower, but first time commenter. I really enjoy your blog and would definitely be sad if you stopped posting, but understand times are changing, and blogging is work! I do hope you decide to keep it up though! I regularly go through your archives for recipe ideas, and enjoy reading your posts when you do put them up. it is difficult to know when to cut the cord when blogging, but i have found your foodsite to be quite interesting and useful and i have just started ‘pinning’ recipes since i am pursuing a new year of culinary inspiration! you are correct in feeling that other methods of communication might be winning over blogs, but the true connoisseurs of food and a healthy wonderful lifestyle are the ones who do not usually make those hit-and-run ‘chirps’…we are the ‘les creuset’ and ‘all-clad’ followers of real food and lifestyle writers…like you! and honestly, your archives of recipes are presented in the most amazing way..great photos, interesting storylines…finding a recipe on your blogsite is like asking a friend and getting not only the recipe and pic, but a having a sort of conversation, too! you are an amazingly helpful and entertaining food writer! maybe keep your fantastic food posts/email notices, but what about sending out additional posts with just a photo or a reminder of some great favourite recipe or even a little ‘hello’ blurb talking about some little happening in your life in maybe five sentences…if we are noticing that you have been missing from our lives, imagine what our worlds would be like if you just ‘chirped’ on your blog page once a week! but if you decide to leave us, then it would be most appreciated to have your archives available…you are a great food and recipe writer, please always remember that! and you would really be missed…. ELS is one of my favorite blogs and I have been coming here for the last 8 years. Yikes! I hardly ever comment because I am a bit shy about commenting on blogs… I guess I feel as though you have better things to do than read my commentary. Some of your recipes are standard rotation in my house (unstuffed cabbage stew, pasta with lentils, sausage, and yogurt, kale with chickpeas and sausage, and more!) and yours is one of the first I check for new posts. I even used your blog as a reference when visiting Vancouver a few times over the last few years. That said, you have to do what is best for your happiness and quality of life. Sometimes moving forward in life is all about letting go! Peace to you and if you do stick around I promise to comment more often. I’ve been reading your blog for a while but never posted. (I even bought the fundraising for Haiti cookbook because you had recipes in it). I look forward to getting your recipes in my email, and make many of them – some of them repeatedly. I would certainly miss your blog if it was gone. Having said that, I realize blogging is work. A lot of work. And I understand the trend is towards shorter and more immediate forms of communication – most of which I don’t participate in. (Only on FB, which probably dates me). So I guess what I’m trying to say is, I’m good with whatever you chose to do – whatever works for you. “Don’t cry because it’s over, smile because it happened”. First time commenter – I really enjoy your recipes! I follow you on instagram and I’m always thinking, I want to make that and am thankful for your recipe archives! My mother swears by one of your granola recipes and has been making it consistently for the past 6 years, it’s delicious. Thank you ! I always look forward to your recipes. Jeez guys, what a way to make a girl feel great on a cloudy morning in deep, deep January!!! Thank you! Robert, don’t fear, I won’t be turning it off. Hosting fees are minimal. I would certainly keep this site up – I use it too as an archive all the time. Lisa, thanks! 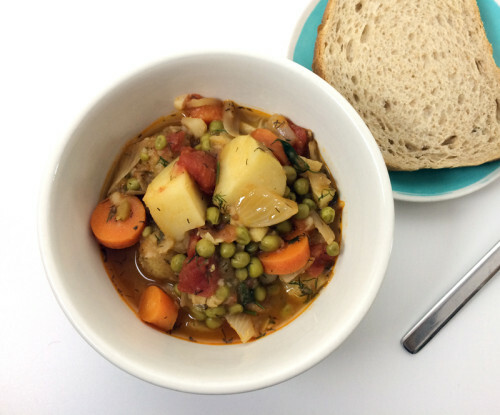 I think you’ll love this stew, it’s a keeper – I’ll be making it again this week. Meghan, I love what you’re doing! Tweaking and trying to figure it out on your own to make it your own space. LOVE. Looking back really does show how much you’ve learned and grown. A good reminder. Thank you! 🙂 Thanks for sharing, Marianne A.
Shannon D, thank you. It’s nice to know that people are reading and enjoying and making the recipes. The emails and comments this morning have been a nice surprise! I agree that sometimes it’s best to let go, we’ll see, Alena. I’m thrilled to know that many of my recipes are in rotation in your house! Sallie, don’t worry, I’ll definitely keep my blog online, no matter what I choose to do. Thank you!! Wow, reading since the beginning! I’m impressed, thank you! Ha, Tibera, I love that quote. I’m smiling, no cries here. Believe it or not, I do have a backlog of recipes to post, so we’ll see if I can muster the energy. Maybe a change or a different attitude is what I need. Thank you! Glad to hear it, dianne a.
I’m in a similar conundrum, except I haven’t posted in a year – decided to switch hosts, and haven’t gotten around to re-doing the site design and starting up again. I’m in a rut. Then again I don’t have a regular readership since mine’s pretty niche (professional related and I’m currently out of work). I hear you on Instagram! It’s where I am my most real and where I get comments from people I actually care to hear from. If you decide to post less often I’d still read you and not complain 🙂 I have commented before and would certainly still use ELS as an archive. I’ve recommended it to many friends! Another first-time commenter here: I want to echo the sentiment that this is one of my favorite blogs and I’ve really enjoyed reading it over the years. That said, I understand that 11 years is a long time to be blogging, and the blog landscape has changed so much over that time. I really appreciate the friendly tone of your posts and the accessibility of your recipes (I’ve never had to special order any ingredients!) Not to mention that everything I’ve made here has been genuinely delicious. So thank you for everything you’ve done, and I look forward to seeing (reading and eating) what comes next! First off, I’m totally guilty of lurking on blogs, which is horrible because I am a blogger! Everything you said rings so true to me. There’s so much about food blogging that has moved beyond the container of the blog and it’s pretty overwhelming at times. I will also say that before I started blogging, your blog inspired and fed me (literally and figuratively). I still use your lasagna recipe 3-4 years after finding it, and it’s still the bones of every one I make, including one that i’m going to blog soon and give you a nod for. oh please keep posting. I love your recipes and your words. While I don’t tend to comment, I have been following you for a long time and would be sorry to see you stop blogging. Though I understand that interests change with time and you need to do what makes you happy. I wish you the best with whatever decisions you make. I love your blog and I really hope you are not going to quit. I have been using your recipes for years now, probably eight to nine years. You are so creative when it comes to food and honestly I don’t care about fancy photos, not to say that your photographs are in any way lacking. It’s about innovative use of everyday ingredients and you excel at that. I made your Cabbage and Rice soup with Chickpeas last week and it was delicious. I definitely will be making it again. And the foolproof recipe that I made probably hundreds of times is Greek Lemon Chicken + Greek Salad. Don’t let instant gratification of social media pull you down. Yoy’ve brought something valuable into my life and for that I’m always going to be grateful. I think I’ve only commented once or twice, but I’ve been reading you for years and years. You’re my go-to girl for unpretentious food, as well as unpretentious writing. I love your dessert recipes — I think I was inspired to grow rhubarb in my yard starting in 2008 because of your rhubarb pudding cake recipe! But I understand that times change, projects change, and it can be hard when you feel like you’re writing in a vacuum. Just know that you aren’t, even though some of us are lazy/shy about commenting. If you’re not getting what you once did out of writing ELS, though, I can understand wanting to take a break. But we’d miss you! p.s. 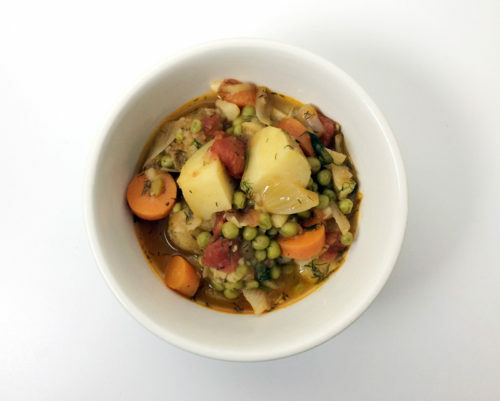 This recipe looks great — I’m always looking for new ways to use dill, and I love peas and potatoes together in anything. I usually don’t comment because it’s not really helpful to say anything unless you’ve made the dish. “oh, I’m making this tonight, someday, next week, never! !” Ugh, I don’t care to read those kinds of comments and I certainly don’t make them. I do enjoy that I can just put my name and email in to comment on here. I don’t want to have to set up disqus or other crap like that just to comment on a blog. Really like your style, your photos & of course your recipes: thank you from NZ! I love reading your blog. I love that you are Canadian as am I. I love your recipes! 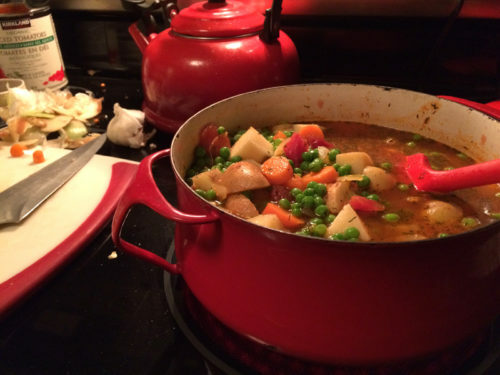 Thanks for updating with your dilemma and this great recipe! Me! I read! I hope you continue to post. But if not, please leave the site up forever and ever. How else would I know how to make tahini granola or pizza dough? Or vegan banana date muffins? Berry & oat breakfast bars?? My very first ELS recipe was the french lentils with pasta & yogurt; I was a improvised-cooking novice at the time and it blew my mind that pasta and lentils could be put together in one meal. I subbed mushrooms for the sausage and packed it as a cold lunch for a trip down to Seattle so long ago. Over the years I’ve worked up to where I barely look up recipes anymore, and reading this blog has undoubtedly had a part in getting my cooking and baking skill up to the point where I can throw together a dinner just by looking at what’s in the fridge, or pop some treats in the oven with whatever nuts and bolts are on hand. Thank you! Echoing Emma’s sentiments… A new post on ELS is a smile in my day. Karen, you’re so sweet! Thank you!! Yes, Aimee, that’s it – it is feeling so overwhelming! I’m hoping that I can continue onwards and march again to my own drum beat. I saw your post this morning and will comment soon – your version looks delicious! Thanks Jacquie, your comment means a lot! Monika, thanks for that! I make that cabbage and rice soup often so I’m glad you enjoyed it! I’m glad I could inspire you to grow rhubarb!! Wow Sandi, that’s awesome! Thanks! JessB, it is funny reading through blog comments like that! I know how you feel. Thanks for sharing! Hooray Kim on getting confidence in the kitchen! That’s so great to hear. YES! This recipe looks great, love the flavors! I have not commented, at least not often, because, like some others who have commented on this post, I always worried about being repetitive and mundane. But this time I risk it, because I would absolutely hate to see you stop blogging without letting you know what ELS has meant to me and my kitchen over the last very long time. So long I have lost track. I surmise that every commenter here is a lover of food. And the food blogs I read do come and go but I have kept this one on constant repeat–indeed, it is the only one that has that honour–because, after making dozens and dozens of your recipes, there has only been one–ONE–I didn’t love. And that was not because it wasn’t good, it just wasn’t my thing and my significant other loved it and happily ate all of what I didn’t. You bill your recipes as uncomplicated and that is absolutely true and absolutely what I love about your blog. You have a gift for putting together accessible but unlikely ingredients and making something amazing that is far beyond the sum of its parts, plus documenting it in such a lively and cheerful way. I think you would be amazed how many of my favorites come from your blog. I would miss the inspiration that comes from ELS if you stopped posting entirely (I suspect I wouldn’t enjoy my CSA share nearly as much either!). And for completely selfish reasons I do hope you’ll stick around and find some new motivation for keeping it going if the old motivation isn’t there anymore. But I am not completely selfish and understand there are reasons for moving on too. If you do continue with even the odd post I think we would all be most grateful. If not, I’d love to see you do something similar in a different format–read: ELS recipe chapbook!–or, even though it isn’t ‘the same,’ I will happily check you on Instagram once in a while. Either way, a heartfelt thank you for all the food and drink inspiration over the years! As someone who has also been a food blogger forever (well, 7 years), I totally agree with this: “I’m not saying that blogs have become antiquated, but the atmosphere has certainly changed a lot in the past 3 or 4 years.” It’s really hard to keep up and really hard to separate what I want to do and what the blog world wants me to do/what needs to be done in order to make sure someone actually sees my work. I don’t know that I’ve EVER commented, but I’ve been reading since at least 2006, when I was still in university and suddenly cooking for myself all the time. I’ve been remiss to not thank you before for essentially guiding me into adult cooking. I learned to cook and bake from my mom, but I learned to adapt pantry ingredients, cook an exciting vegetables-first diet (my family are much more carnivorous), and figure out flavours here. While I only look up recipes here a few times a month, I’d guess that there’s ELS influence in about 90% of my cooking. I definitely understand the waxing and waning of Internet projects, though, and am happy to see the blog survive as an archive, an occasionally-updated blog, or in some kind of new life. Thanks for your candid post. I’ve been reading ELS for so many years — I’m not even sure quite how long, but it was one of the first food blogs I started reading — and I’ve been noting the lesser frequency of your posts and worrying that you might be considering closing up. I’d be so very sorry to see you go, for your recipes, your style, and the glimpses you offer of Vancouver, where I used to live and which I still miss so much having moved to Toronto for a job nearly a decade ago. I confess, though: I am not a commenter, and never have been. The web is so loaded with people talking … does anyone *really* need to hear more, from me in particular? Isn’t it ok to just listen (can we say “listen” instead of the more negative “lurk”)? …but then, I realise, that doesn’t let you, or anyone else, know I am here reading and appreciating. So: many, many thanks for all you’ve given in this space! I’ll understand if you go, but I hope you’ll stay. So happy to see you back on here and that you’re giving blogging again some consideration. I am a huge fan of your writing style and cooking and whatever you like to share with your readers, I’m happy to be a part of it. I’d love it if you would continue but of course, it’s entirely up to you. 🙂 Thanks also for posting the Greek peas and potatoes dish. You did a marvellous job on it. It’s one of my faves and I love it for it’s simplicity and rustic quality. And also, as you mentioned on instagram – it’s very feta-friendly. I love your blog! I don’t always comment, but I always read your posts and have gotten a lot of my regular rotation recipes here. I’m feeling what you say though. I’ve been asking some of the same questions myself. Decided to take a vacation and see if that helps jumpstart my creativity. If it doesn’t, well at least I got a vacation out of the deal!! I love the contact my blog gives me with other people who are food obsessed. I’ve been a long-time lurker on your blog but have rarely – if ever – commented. I think I first stumbled on this blog around 7 years ago. I liked the entry that I read, so I started reading some of your older entries and now it’s one of the few blogs that I check regularly for updates. I enjoy your recipes because they are often healthy and flavorful, but also manageable – they usually don’t rely on hard-to-find or ridiculously expensive ingredients, or difficult preparation that takes half a day and every pot, pan and utensil in the kitchen. But I also keep coming back to your blog because I enjoy your writing style. I hate to say it, but there are a few blogs I used to love that I no longer care for as much because it feels like the writers’ egos have grown with the success of their blogs and books and it shows in the tone of their newer writings. But I always appreciate your down-to-earth, approachable style. I’m another faithful reader who’s never left feedback, and there’s little to add to the many thoughtfully written comments that have already been left in response to your post. I just want to offer my thanks for your recipes, which my four adult daughters and I use regularly. Whatever you end up doing, you should know that you’ve been the quiet voice that gets our attention when seemingly everything else on the Internet is overstated and competitive. So good luck, and thank you very, very much. Janice, thank you! Your comment means so much to me. I didn’t realize how many people still read this thing, so seeing how much this blog has meant is definitely a shake up to how I’ve been feeling. Thank you! Thanks Emily, I’m glad to know that I’m not the only food blogger feeling the same way! Kate, I learned so much from my mom too and having this blog has also changed how I cook and eat as well. Thank you! Thanks Nicole, there’s so much of me that wants to continue and after reading your comment & all the others too, I think it would be hard for me to stop. I probably can’t promise weekly posts, but I can try to write and focus to work on better, more heart felt posts. Thank you! Mary, big hugs, thank you!! Gorgeous! This is great for winter… so hearty! I have had the same conversation with myself and while I have never (and really I do mean NEVER) had the success or comments of your blog, I finally came around to knowing I had to do it for myself. It does not help that the various social media sites manipulate data feeds, but that aside I have come here many times (without leaving a comment, sorry) to see what you are up to. And as bloggers grow and change the challenge of keeping a blog up, can be overwhelming (especially when it seems no one is visiting, because let’s be honest, this is much like a visit in one’s own home and no one visits alone.). I was glad to see your post, and no matter your decision, I wish you well! PS if you come to Portland again, it would be fun to run into you, as I live in Vancouver WA. I agree with everyone who commented above. You’re one of the blogs I read consistently and I follow you on IG. I also have found myself blogging less, but it’s not for lack of cooking. I think life gets in the way sometimes and I just have to learn to make the time. I am SO trying this stew. It gives me an excuse to cook peas which I never make enough. Hi – I love your blog writing, and your recipes. I can understand that you want to move on. All the best. Will the recipes still be available as an archive cuz your site is my go-to when I need inspiration. I would be really sad if you get rid of your blog. I think more people look at blogs than you think. Instagram is one thing, but to get really deep and personal, especially with food, you need to be able to express yourself. This recipe looks absolutely amazing as well! I’m late to the party, but I just wanted to add my voice to the crowd. I recently became a vegetarian and I don’t think I would have been able to do it without ELS. I’ve never commented, but I am here and listening and very grateful! Gillian, thank you, I’m so glad to hear it. Jo-Anne, we’ll see what happens, I’ve already added a new blog post, so I don’t think I’ll be abandoning this space just yet. Kyrsten, it’s true, it’s been a big surprise all these comments. Thank you for cheering me on. I just want to say that this is my favourite food blog (and I read a lot of food blogs). There are many reasons for that, but a few are: your recipes are always delicious, and your posts are down to earth– I mean that as a compliment. When I read your blog, I always feel like I can achieve the same results in my own kitchen; I don’t feel the same way when I read certain other blogs where the food has been styled and the photos just so-so and it’s confessed the recipe had to be cooked (not tested… attempted) 4 times before it even turned out. Anyway, thank you for writing the best food blog! I’ve enjoyed it greatly over the years. I am from BC, but now live on the east coast in the States. I visit your blog for recipe ideas when I am wanting a connection to home. Of course, that’s often why we cook, but being able to cook something that loops me back in to the people/place/trees/culture that resonates with me is truly lovely. So thanks, and I hope it works for you to keep blogging, however sporadically it might be.